Protest songs have been around for centuries with the earliest known one being written in 1382 when a folk song called The Cutty Wren protested against English feudal oppression. They became more popular towards the end of the 19th century when issues about women’s rights and the abolition of slavery were highlighted. As the 20th century dawned, other subjects like the Great Depression, the Civil Rights movement, the Vietnam War and racism all spawned protest songs with one of most well known ones being Billie Holiday’s 1939 offering Strange Fruit. 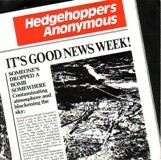 By the 1960s there was a mountain of them including Sam Cooke’s A Change Is Gonna Come, Barry McGuire’s Eve of Destruction, Bob Dylan’s The Time’s They Are a-Changin’ and, this week’s subject, It’s Good New Week by the 1965 one-hit wonder group Hedgehoppers Anonymous. The English producer and singer/songwriter Jonathan King, whilst at University, had been signed to Decca records and had a hit in the summer of 1965 with Everyone’s Gone to the Moon. He saw them performing in Cambridge and got them signed to Decca. He took them under his wing and the following year changed their name to the Hedgehoppers, an RAF slang term for the Vulcan bomber which flew low to avoid radar, and added Anonymous to it. It initially caused a problem for the band, not with regards to the lyrics but over their name. “I was working on a nuclear base, and it was taking the mickey,” remembered Mike, then the brass took an interest and the C.O. of the base was very angry. We were marched in, hats off. I suggested it was a good publicity for recruitment” but the C.O. wasn’t impressed and Mike decided to leave the RAF and hit the road. Mike took part in the Japanese Yamaha Music foundation Competition and began song writing for Joe Dolan and Kelly Marie. Now 74 years old he continues to sing and record. Jonathan still keeps his hand in in the music business and his keen ear and eye for spotting talent is still appreciated by many people in the business. The song got a new lease of life when, in 1996, it was used for four years as the theme music for an Australian satirical news-based comedy quiz show called Good News Week.